It is a truth universally acknowledged (as Jane Austen might say) that improving your retour is a lifelong task. Like any other interpreting skill – only more so – it obeys the maxim ‘use it or lose it’. Most interpreters would also take it as a given that the best way to maintain or improve your retour is to interpret a speech into their B language, and get feedback from a native speaker of their B about the overall coherence of their interpretation, as well as infelicities in the use of language. they can spot errors of syntax, register and vocabulary. they can point out when your interpretation isn’t clear enough (perhaps because you haven’t been sufficiently explicit in explaining a cultural reference). above all, they can offer alternative solutions, thus enriching your active vocabulary and allowing you to do better next time. The thing is…sometimes you don’t have access to a tame native speaker to give you a hand. You may just have finished a Master’s or other course in interpreting studies, for example, and once you’re no longer attending classes, you don’t have a tutor or classmates giving you tailored feedback every day. How can you keep practising productively? As I see it, there are two possible approaches: find yourself a tame native speaker who is willing to practise with you or coach you, or go solo. 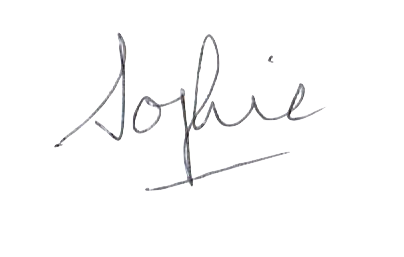 In this blog post, I’ll be focusing on the former approach; look out for Part 2, where I’ll be talking about how you can self-train (oh, how I hate that word!) productively, even in the absence of a native speaker. You’re wondering: why elusive? After all, let’s say your B language is Italian and you’re living in Italy, you’re surrounded by native speakers, right? Well, yes. But not all native speakers are equal. They can’t all give you what you need. Most non-interpreters, if asked for feedback on your use of language, will be able to pick up on glaring errors (problems with conjugations, declensions, words that don’t exist, pronunciation that makes you impossible to understand). They are reacting as clients, and identifying aspects of your interpretation that make it difficult for them to follow, or errors so noticeable that they may lose confidence in your ability and skills as an interpreter. This feedback is useful, because it gives you an insight into how you are perceived by your client. identify recurrent, structural problems in your use of language (for example, word order when asking a question). identify issues with register and nuance, and explain why one solution is appropriate when another is not. prompt you to find alternative solutions in tricky places, or offer solutions themselves. The more linguistically aware your practice partner is, the more useful their feedback is likely to be. My feeling, though, is that your best bet for improving your retour is to work with someone who is not just reacting as a client, but as an interpreter, or (best of all) a coach. If you have time and money and can travel, try a short course that focuses specifically on retour. Your trainers will be specialists who can give you constructive feedback. Where can you find out about short courses? keep an eye on AIIC’s (the International Association of Conference Interpreters) Events page, for a list of training events. 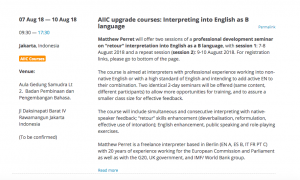 AIIC runs short retour courses all over the world, and they are not only aimed at those with an English retour. 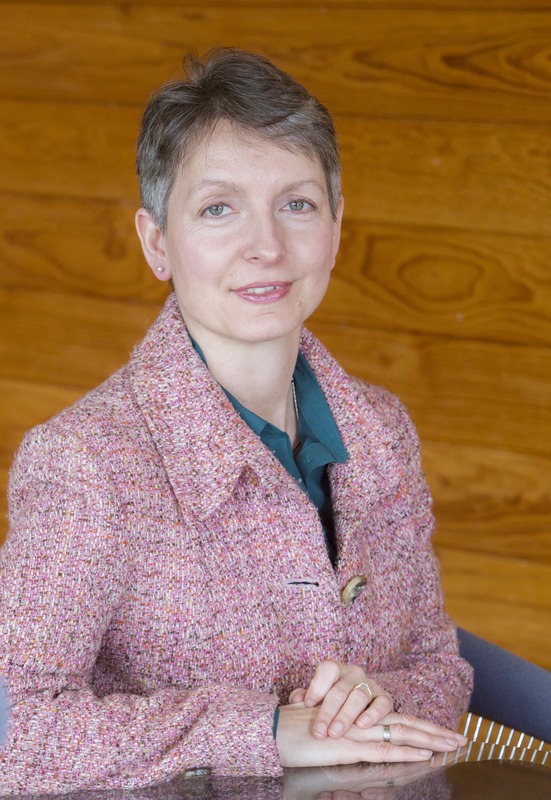 if your B language is English and you’d like further training in the UK, there are a couple of highly regarded summer courses: a summer course organised by Zoe Hewetson and Christine Adams, and the Cambridge Course, run by Christopher Guichot de Fortis, staff Senior Interpreter at NATO Headquarters in Brussels, and Julia Poger, freelance interpreter. This is not specifically a retour course, but >EN and >FR are just two of the (many) language combinations covered. You could also consider attending part of a university interpreting course. Manchester University runs a four week post-exam session (in June/July) focusing on simultaneous interpreting and advanced skills. If you are already a professional interpreter and wish to turn an English C into a B, this is a plausible option – especially as it involves a period of immersion living in the UK. If you have less time and money, and/or can’t travel, find an online coach. Word of mouth is the best way to get a good recommendation. You are welcome to contact me if you are looking for English B coaching. This is a good solution if you enjoy working with your peers, and don’t have a big budget to invest in further training. Find a practice group. These are not always easy to track down. A good place to start is Facebook; see if there are any interpreters’ groups near you. 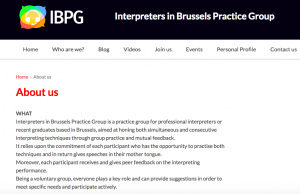 If you’re in Brussels, get in touch with the IBPG (Interpreters in Brussels Practice Group), which is friendly, well-run and professional. They used to run specific French-English retour sessions, and the regular weekly sessions cover several language combinations. Even if you can’t work into your B at one of the practice sessions, it’s a great place to meet fellow interpreters and organise to meet up with a partner. 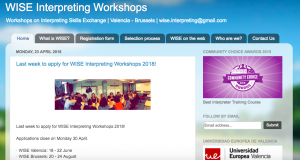 WISE workshops are a roaring success, and run in Valencia and Brussels every summer. The idea is of a mutually beneficial exchange between participants, who are not paid; you give speeches for others to interpret, and you interpret others’ speeches. Retour tends to be a big component of the workshops, and you can expect English, French, German, Spanish and Italian to be covered. Run along similar lines to the WISE workshops, the Leeds ENIT initiative is an opportunity for interpreters with English and Italian to practise their skills. Find a practice partner. Again, this is not always straightforward. You may be able to stay in touch with a fellow interpreting student, if you’ve just finished an interpreting course, and organise regular practice sessions. If your course has an alumni network, this is also an opportunity to connect with someone who has the skills and language combination to help you. Online platforms can be useful as well. Try Interpretimebank, based on the time-bank principle; you give feedback to another member, ‘bank’ the time involved, and organise to receive feedback from someone else with the right language combination. In a few weeks, the revamped version of Speechpool will allow you to search for a practice partner. I hope these suggestions have given you some good leads for finding someone suitable to help you improve your retour. Was there anything that the audience would find difficult or impossible to understand? If so, what was the problem (poor explanations, inappropriate vocabulary, lack of logic, pronunciation, or poor use of the target language)? This is the bottom line for your credibility and reliability as an interpreter, so it’s the first thing the feedback should focus on. Were there any recurrent issues with use of language? What you’re trying to do here is identify patterns in the way you use your B language, so you can go away and do some tailored exercises to remedy the problems (which might be with morphology or word order, say, or the way you express numbers). If you are looking for detailed feedback on every little mistake you made, make sure you ask the listener to try to categorise your errors rather than just listing them all higgledy-piggledy. See if you/they can classify the errors (for example: difficulties with the use of articles or prepositions). Again, this gives you a specific problem to work on systematically, rather than a long list of one-off mistakes. Bear in mind, though, that it is much more interesting to think about your interpreting strategy and systematic errors thank about trivial one-offs that may never occur again in a different speech. If your listener identifies particular phrases that sounded unidiomatic, see if you can come up with an alternative. Ask if it sounds right. Ask if your listener has a better alternative. The aim of the exercise, after all, is not just to know what you did wrong, but how you can improve next time. 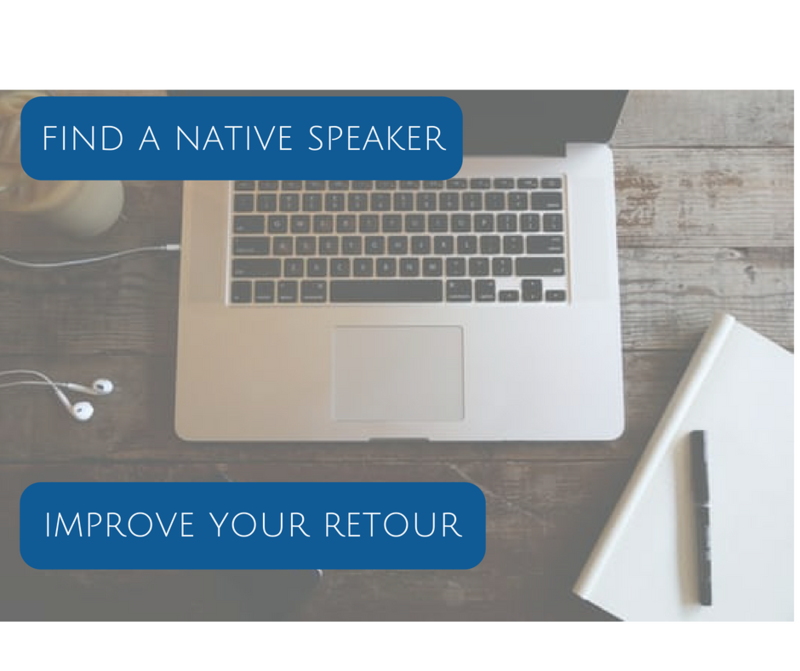 Do you have any tips to share about finding native speakers to help you improve your retour? Leave a comment below the blog post – I’d love to hear from you! p.s. look out for Part 2 of this blog post, in which I’ll discuss how you can work productively on your retour skills in the absence of a native speaker. Thank you for clarifying, Julia. Everyone I have spoken to who’s attended the Cambridge Course has found it incredibly useful, and a real confidence boost. 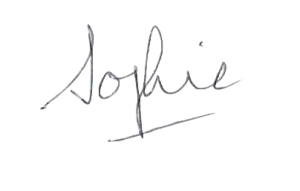 Thank you Sophie for putting together great ideas on working on one’s retour. It is an area in which people need more information! We at the Cambridge Conference Interpretation Course also really appreciate the mention, and are happy we are on your radar! We would just like to say that the CCIC is much more than an English retour class. It is true, EN has to be somewhere in your combination for an interpreter to attend, as that is the language of instruction. However, we cover six languages (DE, EN, ES, FR, IT, and RU) and work with anyone who wishes to go in any direction using those languages. For example, we have had people working on their UN combinations in the ES, EN and FR booths; many biactives with EN, some of whom were native speakers of EN; some working on combinations that did not include EN (DERU, ITRU), etc. – an infinite variety!